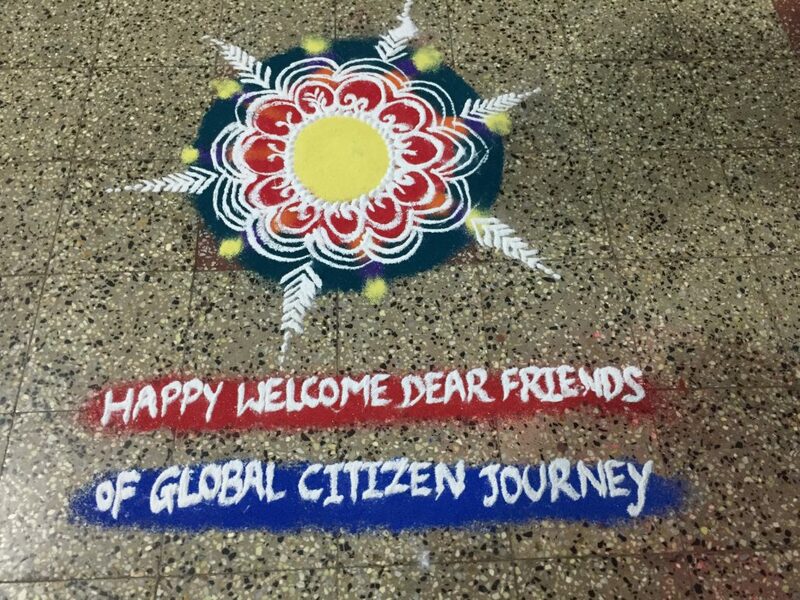 GCJ India 2017 delegation is complete! The weeks were so packed and amazing that I never got to blog during the delegation itself! Now the US delegates have departed and I am alone for a few days in the beautiful hill station of Panchgani at a wonderful conference center and headquarters for Initiatives of Change (IofC) — an organization that was once called Moral Re-Armament (MRA), an international moral and spiritual movement founded in 1938 by Frank Buchman as Europe was re-arming militarily. Look it up on Wikipedia – a remarkable organization that has nurtured many ‘global citizens’ for so many years. Like Compassionate Listening, they believe change arises from the inside out. They identify four absolute values: honesty, purity, unselfishness, and love. It has been wonderful to have the beauty of this refuge filled with calm and green trees, flowers, and positive vibrations — before I rejoin Maher with all its vibrant life, chaos, and the noise of streets and many children – all bathed in love and compassion. 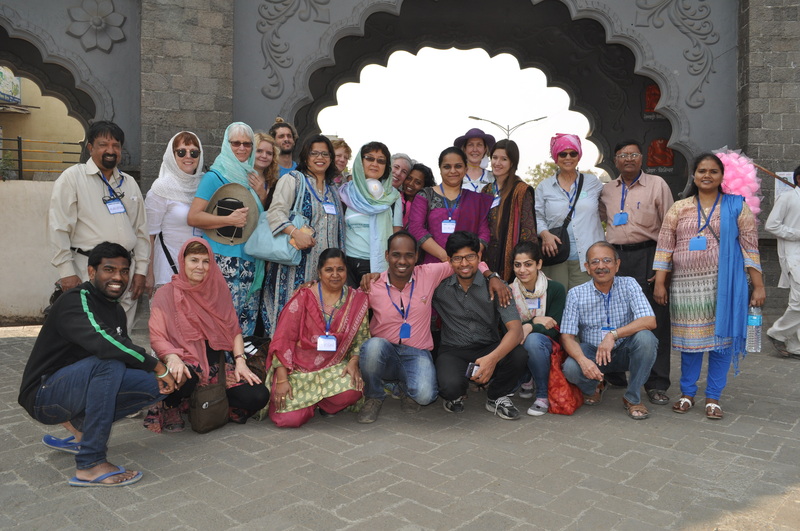 Our GCJ delegation was filled with 24 extraordinary people. Of course, I knew our awesome 8 US women well – and felt so deeply supported and appreciated by them. 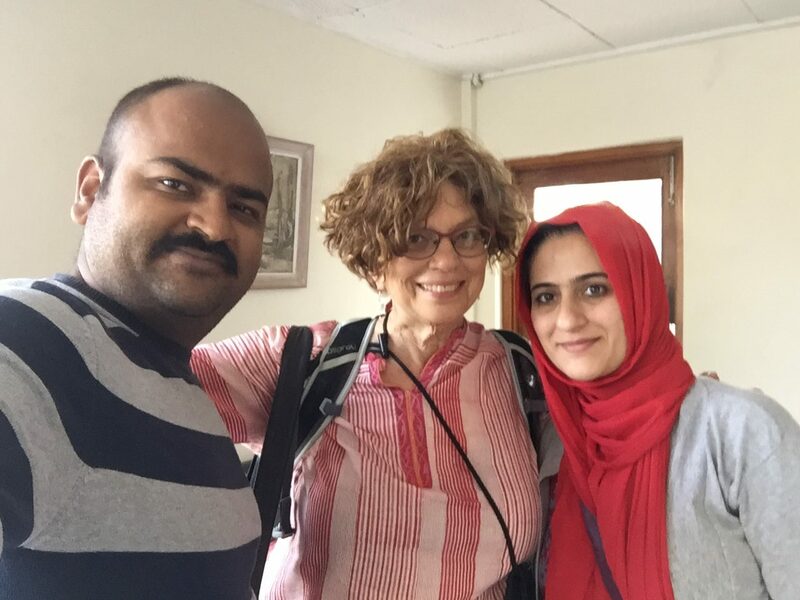 Then we had 3 internationals – a German young woman of just 18 years who is on her gap year as a volunteer in Pune, a lovely young man from Venezuela who has been volunteering at Maher, and a Spanish woman who had been an intern in Pune as a social worker. Then we had our amazing Indian delegates – 5 women and 4 men plus 3 Maher guys (Mangesh, Gaus and their dear friend Nikhil). So in all, the delegation comprised 8 men and 16 women (including me!). 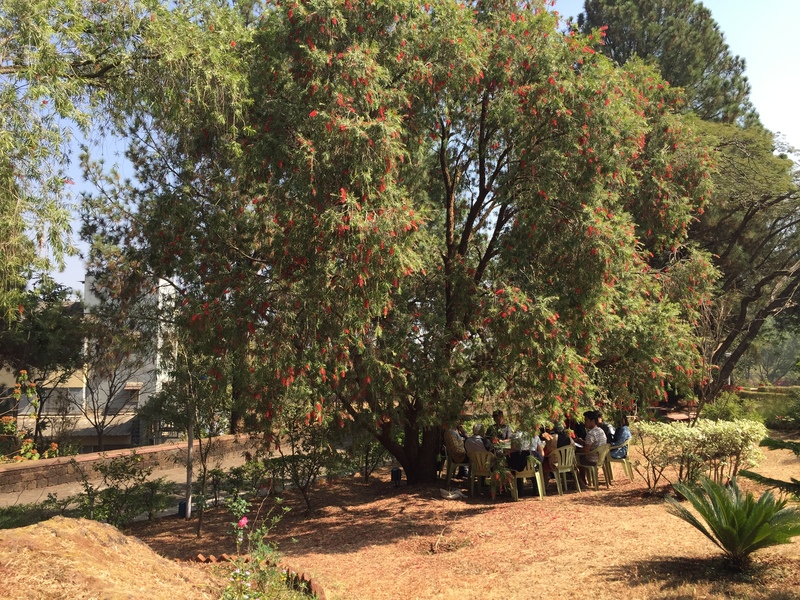 We had about a dozen circles – including team building, compassionate listening. and a powerful gender dialogue. Fascinating discussions! Of course, we had a lot of explaining to do about our new US administration. Many of us made traditional home-cooked dishes for each other: I made matzoh ball chicken soup, Irene managed to make apple crisp, and Liz stuffed us with her amazing self-caught and smoked salmon plus more. While together at Maher – we stayed at Vatsalydam. It is one of the largest homes, a big property with gardens and smaller homes for grandmas, boys, and mentally-disturbed persons, and elderly men. The main house had over 100 mentally ill or developmentally-delayed women on the ground floor and several homes for girls on the upstairs. It was so beautiful to see the interactions between these different groups – filled with loving compassion, patience, and affection. Some of my favorite times were singing and dancing joyously together, playing with the kids, and hugging the women. Some of our most exhausting moments were the trying, long, bumpy, and dusty bus rides to many outlying Maher homes. When I have a chance to debrief with Gaus, Mangesh, and Sister Lucy we will explore the question of ‘quantity’ vs ‘quality’ of these visits from the delegates perspective. We longed for more time to interact with the residents but often these visits were mainly being very, very warmly greeted – with song and ritual (incense and bindi marking with red vermillon or gold turmeric powder, perhaps a cup of tea or water, a short talk, occasional performance by students, possibly very short Q&A, etc). Before we knew it, we were back on to the bus to yet another location. Of particular interest was the tribal village that has been transformed by the relationship developed with Maher. Now they are growing many acres of veggies and children are going to school. We saw the slum where the ‘Fun School’ attracts little ones with games and food as they wouldn’t be sent to school. Also, after ten long and patient years they now have a computer lab for the older children. What a struggle of love, after building relationship and trust (15 years ago or so, Sister Lucy actually moved in to live in the village for several months – they were so wary, thinking she was coming to convert them to Catholicism or trick them and take their land which had happened by others) the Fun School started. Some of the school-aged children were brought to live at Maher so they could go to school. They began to show the value and the culture changed to where school was appealing. One of the school girls has now become a policewoman and another one a social worker! They started the computer lab about 10 years ago: at first it wasn’t valued – no one knew anything about computers. They were all stolen. Sr Lucy persevered and put replacements in. After a while again they were stolen. Again she put in replacements… by now some of the kids were learning and appreciating and the community came to value them and trust her sincerity. So at last, the community itself guards them and calls as soon as there is any trouble. One of my most striking insights or lessons as a global citizen came on that visit day: one of the delegates said, well why don’t they just put in a security camera! Mangesh, dear one who grew up at Maher and says, ‘love is my religion’, quickly responded: that would be materialistic instead of heart-fullistic. Wow! In our western world we value the thing – the property – and I realized I was blind to the message hidden in a security camera which is that we don’t trust you and we value this property way more than our relationship or connection with you. I am fatiguing so that’s all for now! I’ll hope to get to write more soon about our amazing Delhi visits with the likes of Vandana Shiva and Swanu Agnivesh as well as several extraordinary NGOs, our tourist adventures in Old Delhi and Agra and so much more about Maher and the delegation. Write to me! Tell me the news and spirit and arising movement!